The University of Leipzig may soon call itself a worthy second largest University of the State of Saxony, Germany. The new campus, designed by Erick van Egeraat, is in her final stages. Last Thursday, June 5 2014, Georg Unland the Minister of Finance of Saxony presented the progress of the new main building and auditorium of Leipzig University in Germany to the press. Erick van Egeraat won the international competition with his design in 2004. The design for the new building of the University of Leipzig is situated on the site of the former Pauliner Church, the only church to remain undamaged during the war, yet later demolished in 1968 during the former GDR regime. With this design Erick van Egeraat found a consensus for decades of debate about the reconstruction of university’s Pauliner Kirche. In his design Erick van Egeraat did not rebuild the church stone by stone, but returns the memory of a long tradition and a rich history for everyone to interpret in their own way. The inner-city University redevelopment consists of three main elements: the Auditorium, the Main Building and the Aula. While the main building is already in use, the construction work in the interior of the auditorium is still in progress. 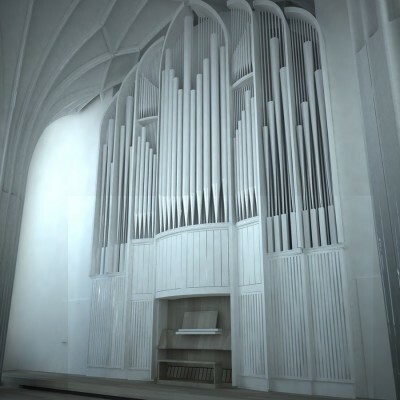 The Aula with Vestry (Andachtsraum), a contemporary interpretation of the former University Church, is a multifunctional space and will be used – like the original church – for church services as well as for academic ceremonies, concerts and scientific conferences. 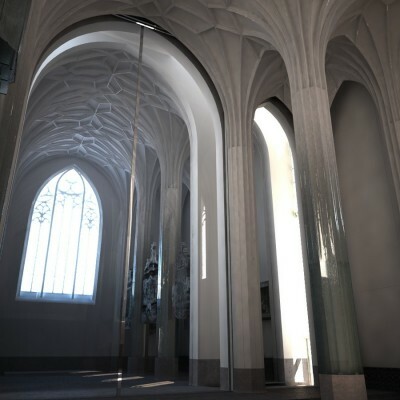 With the original church space and its cross vault as a reference, the vault construction is erected from a combination of white glossy and matte plaster work, crossing over into translucent and transparent glass columns. 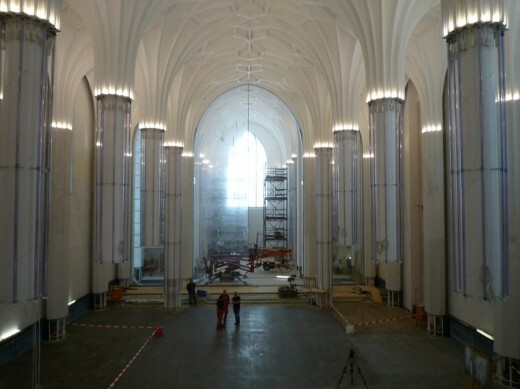 During the tour on June 5, the visitors got a first impression of the auditorium space and its special features such as the integrated organ and the world’s highest transparent sliding door consisting of two sections both with a height of 15,5 meter, which divides the church space in two: the more secular auditorium for different events, and the more contemplative so-called ‘ Andachtsraum’, where the Epitaphs are displayed. The vaults with the columns – where three column pairs do not continue to the floor in order to increase the functionality – ensure that the space, regardless of the sliding door, can be experienced as a whole. The completion of the project with the last part of the auditorium and ‘Andachtsraum’ is scheduled for spring/summer 2015. With this, the University located at the Augustusplatz in Leipzig regains her dignified identity and significance for the city, region and in Germany and the world.